Virtual reality. It’s the next great thing, and you just want to experience it, but there are so many options. What’s the right headset for you? If you get the wrong headset, what will you be missing out on? Don’t worry. I’m here to help. In this article, I’ll not only review the entry-level VR Box 2.0 headset but discuss some alternatives. So, you can figure out exactly what you need to get the virtual reality experience you want. Before we get started, though, there are a few things you should think about. How Much are You Going to Use the Headset? Many entry-level headsets are made of cheaper plastic which can break more easily. Additionally, low-quality lenses may cause blurriness. This can not only lessen your experience but cause nausea after prolonged use. Which is More Important, Your Budget or Your Virtual Experience? Entry-level headsets can be a great way to start to experience VR, but you’re just getting the tip of the iceberg. Higher-end headsets cost more, but they offer a much more immersive experience. They also have a much more extensive library of games and apps. Spectacular 3D Reality Vision -- All you need is positioning you phone, adjusting the angles of viewing, then you will see immersive 3D virtual reality through the lens as watching a 320" screen. Eyes Protecting & Comfortable -- 8 Layers nano coating lenses to reduce 90% of phone screen radiation and harmful blue light reflection; Soft leather padding keeps your skin comfortable even after hours watching. 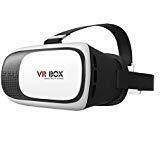 The VR Box 2.0 is a low-priced, basic virtual reality headset. It’s a decent way to enter the VR world, but don’t expect a lot from it. It has a 3-strap harness and soft padding. The padding isn’t particularly breathable, so your eyes/face may get warm after prolonged use. The headset uses your smartphone for the VR screen and to run apps. So, you are limited to basic virtual reality games and 360-degree images and videos. Your phone is secured in an adjustable tray you slide into the side of the headset. The tray fits phones from 3.5” – 6” diameter length. The VR Box 2.0 uses spherical resin lenses. Unfortunately, spherical lenses tend to create blind spots or blurry anomalies within the screen’s image. You can adjust the lenses for focal distance (distance from your eye to the lenses) and pupil distance (distance between your eyes). There are also no hand controllers or buttons on the headset. So, you have to remove your phone to navigate or buy a separate Bluetooth controller, like this one. The VR Box 2.0 offer several benefits which may make it a good option for your first VR headset. The VR Box 2.0 uses an adjustable 3-strap harness. This design not only secures the headset to your head but takes some of the weight of the goggles off your face. There is soft padding where the headset rests against your face. This makes for a comfortable fit. The padding and headset aren’t very breathable, though. So, your face may get warm when using the headset. There are no built-in headphones, but there is a hole in the headset for your headphone’s wire. So, you can use any headphones or earphones for audio. Initially, you may think that built-in audio is a plus, but often it isn’t. Many inexpensive VR headsets with built-in headphones have terrible audio quality. No built-in headphones mean you can use your own headphones for good audio. Just thread the wire through one of the holes on the side of the headset and plug it into your phone. Of course, Bluetooth headphones work as well. One of the more impressive features of the VR Box 2.0 is the adjustability of the lenses. Many headsets do not have adjustable lenses. For those that do, the lenses are connected. So, you must adjust them together. Unfortunately, our eyes don’t usually have the same visual acuity. So, it’s helpful to be able to adjust the lenses individually. You can adjust both the pupil distance and focal distance independently. The focal distance can be adjusted to correct for up to 600 myopia. This can help give you a clearer image, though it won’t fix the blurry spots caused by the spherical lenses. The headset does have a sliding window on the front to expose your phone’s camera. This allows you to use augmented reality (AR) apps in addition to virtual reality. Augmented reality is actually a faster-growing market than virtual reality. There are many AR apps that you can use for practical purposes rather than just entertainment. One example of an AR app is Pokémon Go. Others include apps where you can visualize furniture in your home or get historical information when touring cities. There are also tabletop games and puzzles. As I mentioned before, the VR Box 2.0 uses your smartphone for both screen and computing power. This makes VR much cheaper. However, it also means if your phone isn’t very good, your VR experience won’t be either. The VR Box works with both Android and iPhone. Its adjustable phone tray fits phones 3.5-6 inches in diagonal length and is not limited to any brand of phone. So, what are the VR Box 2.0 headsets like in the real world? Everyone’s experience is different, but I found that most reviews were pretty positive. Here are some of the customer reviews I found around the web. Reading product reviews are most helpful when you can see how those reviews compare to the reviews of other similar products. To make life a little easier for you, I’ve included a few brief reviews of some other virtual reality headsets and let you know how those headsets compare to the VR Box. I’ve selected headsets that range entry-level (like the VR Box) to higher-end headsets. This will give you a better idea of what is possible with virtual reality headsets. That way you can know what you are getting or not getting with the VR Box 2.0. Our first alternative is the Samsung Gear VR headset. Like the VR Box, the Samsung Gear VR uses your smartphone for the screen and computing. The Gear VR, however, only works with later model Samsung Galaxy and Note devices. The Gear VR is of a sturdier build. It also has more comfortable and breathable face padding. It only has a 2-strap harness, though, which adds a little weight to your face. It comes with a controller. So, you can navigate your phone without removing it from your headset. You can also use the controller for games. Read our Samsung Gear VR headset review for more comprehensive analysis. The Gear VR promises a sturdier headset with a controller. It also has better lenses. If that sounds good to you and you already have a Samsung device, you may want to choose the Samsung. 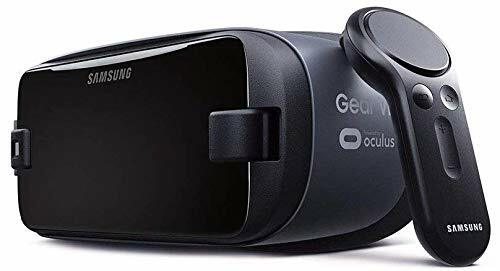 Check the Samsung Gear VR price on Amazon. We were attacked by malicious negative reviews, please check their review history. √ 103°VR View - Stand on the summit of Mount Lyell and overlook the surrounding mountains covered by snow; imagine the wind blowing across your face. . . Our 103 degree field of view makes you feel like an actual climber, not as a mere watcher or viewer. It balances immersion and clarity of view while providing you the most excellent VR view to watch 360 degree video. √ Eye Protected Anti-blue Light HD Lenses - Eye-protected lenses with unparalleled clarity make VR movies a visual experience comparable to world-renowned IMAX. DESTEK V4 will always make sure you have the best seat in your private theatre wherever you really are. NOTE: the remote control of V4 combo can't support Daydream Apps. The Destek V4 is very similar to the VR Box. It is a mobile VR headset with a 3-strap harness. It does not have built-in audio. The lenses are also adjustable for both focal and pupil distance and help adjust for myopia. The Destek also has some differences. It has a conductive button which helps you use your phone’s buttons without removing the phone. It also comes with a Bluetooth controller for navigation and gaming. Also, the lenses are aspheric, preventing distortion and blurriness. If you want a clearer image and a hand controller, then the Destek V4 might be the best option for you. 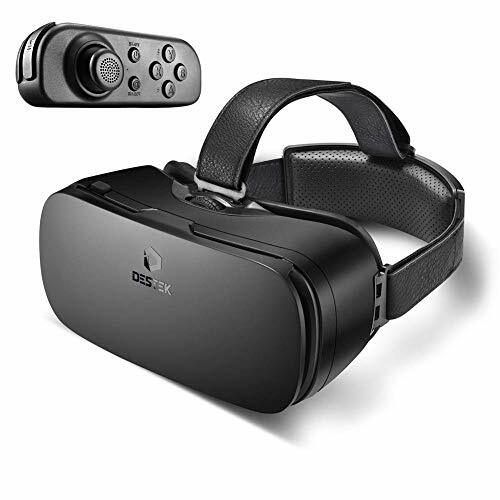 You can find more information or purchase the Destek V4 VR Headset on Amazon. Even on our reviews of lower-end headsets, I like to include one higher-end alternative. This allows you to get a better idea of what is possible with VR. If your budget is a little flexible, you may decide spending a little more to get the full VR experience is well worth it. The Oculus Rift VR system does not use your smartphone. It connects to your computer. This allows it to run much higher-quality games and apps and the graphics are stunning. It also, however, means you need to have a decent gaming computer. When many people think of virtual reality, they think of moving through a virtual space. Lower-end headsets can’t do this. They only track your head turning. The Oculus Rift has motion tracking. There are external sensors you set up which track your head and hand movements. This allows you to move through the virtual space and give you a fully immersive VR experience. 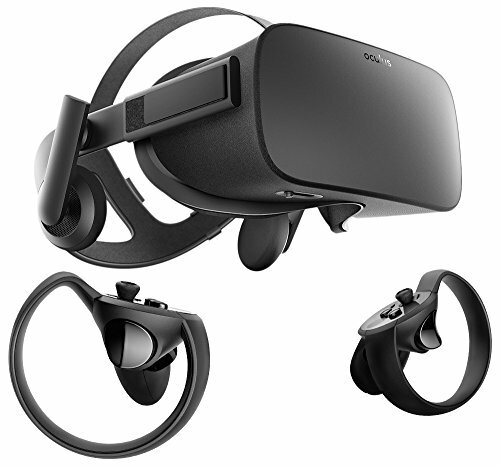 If you want the full VR experience with high definition graphics and motion tracking, then you probably want to go with the Oculus Rift. It costs more, but the experience is night and day compared to the VR Box. You can discover more or purchase the Oculus Rift by clicking on Amazon. The VR Box 2.0 is a decent, inexpensive headset. It has some great qualities, like adjustable lenses and augmented reality. However, the spherical lenses can cause issues. Also, I highly recommend buying a Bluetooth controller along with your VR Box. So, you don’t have to keep removing your phone. If the VR Box 2.0 sounds like the headset that best fits you, you can click here to buy yours, today.